How do I measure Haze with EasyMatch QC? Haze is the scattering of light by a nearly clear specimen that results in a slightly cloudy appearance when the sample is viewed in transmission. Haze is measured by calculating the ratio of the diffuse/scattered light relative to the total light transmitted by a specimen. Haze in conformance with ASTM D1003 Part B can be measured on most of HunterLab’s sphere instruments: ColorQuest XE, ColorQuest II Sphere, UltraScan XE, UltraScan PRO, and UltraScan VIS. To perform haze measurements in EasyMatch QC you must first standardize the sphere instrument in TTRAN Total Transmittance mode, preferrably using LAV (Large Area of View). 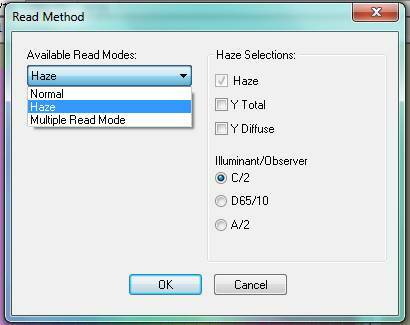 From the File Menu, select Options/Read Method and set the Read Method to “Haze”. A window will open that allows you to choose from various read methods in a drop down list. Select ‘Haze’ from this list. There is also the option to display the Y Total and Y Diffuse measurement components as well as the choice of illuminants and observers for the haze measurements. 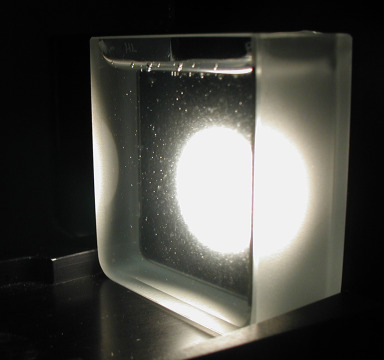 Many customers measure Haze% to quantify the degree of scattering in the sample, and Y Total to quantify the total amount of light transmitted by the sample. If your test method or SOP does not specify the illuminant/observer to use, C/2° is suggested as being the historical choice. D65/10° and A/2° are also used in some industry SOPs. Once selected, you will now see three options: 1. Haze%, 2. Haze% & Y Total or 3. Haze%, Y Total, & Y Diffuse. Haze measurements require two readings. One reading is taken with the calibrated White Tile at the reflectance port and one is taken with the Light Trap at the reflectance port. EasyMatch QC will prompt you for the proper backings when taking haze measurements. As an option, we recommend you perform a PQ (Performance Qualification) step by reading the back of your top-of-scale standard used in the standardization process. Typically, you would standardize on air as your top-of-scale for transparent solids, or a transmission cell filled with DI water if measuring liquids. If you read your top-of-scale as a Standard or Sample, it should approximate a reading of Haze% = 0.0, Y Total = 100.0, Y Diffuse = 0.0. Now proceed to measure your sample which will read relative to your top-of-scale being perfectly clear. Typically, samples scatter slightly so the Haze% will be > 0; Y Total < 100; Y Diffuse > 0.